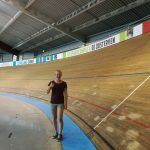 The Sports Engineering Institute of the TU Delft invited students from Delft, Shefflied, Chemnitz, Amsterdam and Vienna for a two-week Special Topic Course. 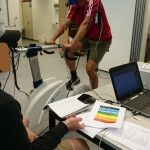 In this annually course, students are having the unique chance to collaborate with students of Sports Science, Mechanical Engineering and Sports Engineering from different universities. With the help of the great funds of the ISEA, I could take part on this unique course. The funds covered almost all of my accommodation and travel costs. The main topic of the Special Topic Course was about all relevant sciences of the bikesport like Aerodynamics and Dynamics. During the lectures have always been room for interesting discussions. As a special bonus, some lectures were hold by specialist of famous dutch bike companies and bike team members. This was really interesting for me, because my plan for the future is to work in the bicycle industry as a R&D engineer. Apart of this theoretical part of the course, we worked together in groups of max. four students on two practical projects, an innovation challenge and a simulation task. We had to meet ourself in our spare time and worked together on both projects. By being a well mixed group with students from Amsterdam, Sheffield, Delft and Vienna with different study backgrounds, each group member could benefits of the collaboration. 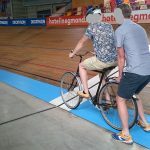 As a highlight, we went on the last day to a velodrome for the final presentations of the innovation task and also for the simulation test. It was interesting to hear about the ideas of all other groups and how they solved the problems and tasks. To come to an conclusion, I am very thankful for the funds of the ISEA because without them I couldn’t take part on this amazing course in Delft where I learned a lot in many aspects.